blog.samseidel.org: NLRB to NCAA, "Take That!" A recent ruling by a regional director of the National Labor Relations Board reminds me just how out of control college sports is, and the NCAA basketball tournament is the perfect time to rail against the multibillion dollar entertainment industry that college sports has become. In a case filed in Chicago involving the Northwestern University football program asking whether college players had the right to unionize, NLRB regional director Peter Ohr found that "Northwestern’s scholarship football players should be eligible to form a union based on a number of factors, including the time they devote to football (as many as 50 hours some weeks), and the control exerted by coaches and their scholarships, which Mr. Ohr deemed a contract for compensation. This is the right stance to take on the matter. Given the huge dollar amounts flowing into the system through television contracts, including a $7.3 billion contract to broadcast college football playoffs and a 14 year $10.8 billion deal to broadcast the NCAA basketball tournament, some change in the system is clearly needed. 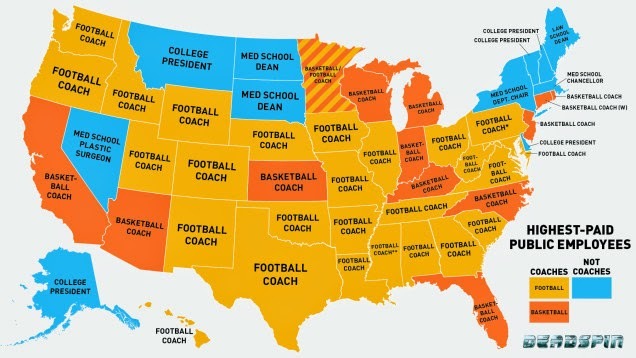 The notion of the scholar-athlete is nothing but an anachronism in much of college sports, and certainly in the marquee programs (men's football and basketball) at the country’s largest (if not best) schools. When universities reap huge financial rewards off the backs of 18, 19, 20 year old athletes who may lose their college career in an instant by an injury, who are steered through college not for their benefit but to maintain their eligibility to play, and who are spending the majority of their time on developing skills that are not transferable to the workplace, then something is broken. It is time for universities to acknowledge that big time college sports at certain universities has nothing to do with their academic mission. It's entertainment and money. If we needed any reminding how perverted the system has become, this map does just that. Today's Diane Rehm Show had an informed, lively discussion on the topic.